Eagle eye readers of my Facebook page may remember I briefly had a post last week saying that I'd do my second porter write-up that day. However, upon realizing that I would not get around to following through with the claim, I quickly deleted the post. But today's the day! With a new layout and logo there's no better time to write about Upland Brewing Company's Bad Elmer's Porter. And what a porter it is. Upland Brewing Company is headquartered in Bloomington, Indiana, which is, fittingly, located in the uplands. Check out the company's about page to read how an ice-age glacier lead to a damn fine brewery. Be sure to admire the photo of a man playing (and presumably losing) a game chess with a dog. I've seen some of Upland's brews for sale here and there. Most notably among these are the Dragonfly IPA and Upland Wheat Ale. I've always been too preoccupied with other beers to pick either of these up. But when I saw a singular bottle of Bad Elmer's Porter, ripe for placement in the pack I was building, I grabbed it and the deed was done. I was to no longer be an Upland virgin. And, judging from the first whiff of the porter currently on the table next to my computer, that's a good thing. It has a nice, roasty warm aroma. It's a scent that's just begging me to indulge myself by tasting the beer. 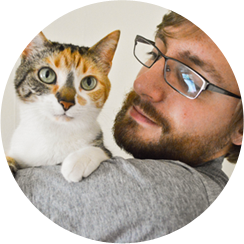 I think it's great and, since she gave it six sniffs, Purrl seems to agree. Bad Elmer's has all the flavors I've come to expect from a porter: coffee, chocolate, and caramel (which, apparently isn't a flavor a lot of people get from this kind of brew? I usually do). Upland's page for the porter says it also has licorice but I don't really taste that. The strange thing about the porter is that it's flavors are subdued; they're present, yes, but not immediately so. The most prominent one is the chocolate which shines most strongly in the aftertaste. Upland says that Bad Elmer's is smooth and it really is. There's not a lot of carbonation here. There is a thickness to the porter, though, but it doesn't hinder the drinkability. 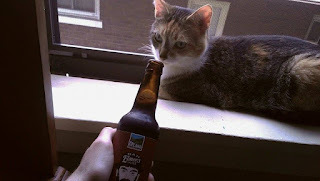 And, thanks to the 5% ABV, I can drink a few in a sitting, should I choose to do so (which I haven't. Yet). I've mentioned in a previous post that I once worked at a summer camp. Something I haven't told you is that the camp's location was gorgeous. It was a secluded place surrounded by enormous (well, enormous by Ohio standards) wooded hills. One day I stood outside the mess hall to witness a storm rolling in across the hills. The sky had been cloudy all day and everyone knew one was brewing. The first thing I noticed was the hail. Before it hit, and before I could even see it, I heard it on the hill before me. It grew louder and louder as it pelted more and more of the pines that ran down the slope. Right before it had crossed the clearing that began at the hill's foot, I entered the mess hall for a cup (not a mug, an actual styrofoam cup) of hot chocolate. I found a seat by the window where I watched the rest of the storm in comfort. Corny as it may be, Bad Elmer's Porter gives me that same warm, comfortable feeling as that cup of hot chocolate in that storm. With Bad Elmer's Upland Brewing Company has proven that they know porters. 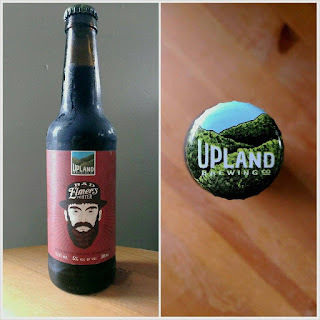 The contents of my bottle have been crafted with such care and experience that Upland's brew now the standard to which I will compare all of the porters I have yet to try. It's a 9.5/10 and a must-try for anyone reading this.